Kazari, including one with an anime theme, at last year’s Tanabata Festival. 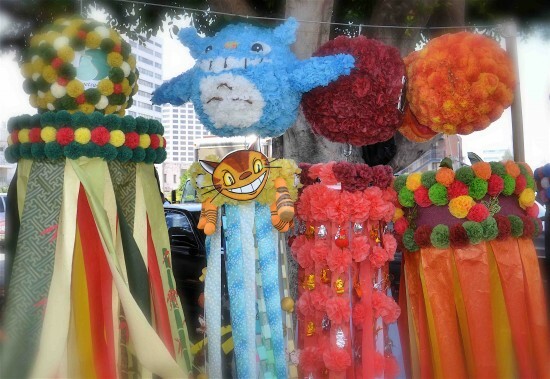 The fifth annual Los Angeles Tanabata Festival will be held in conjunction with the Nisei Week Japanese Festival on Saturday and Sunday, Aug. 10-11, in front of the Geffen Contemporary at MOCA and the Japanese American National Museum at First Street and Central Avenue in Little Tokyo. Highlights of the two-day festival include a display of 10 award-winning kazari (ornaments) from the 2013 Sendai Tanabata Festival. The event also features entertainment, food, arts and crafts, and a variety of games are part of the celebration. Opening ceremonies are set for Friday, Aug. 9, from 5 to 7 p.m. with the traditional celebratory breaking of the sake barrel. Brian Kito, chairman of the festival, stated, “The theme this year is ‘Children’s Dreams.’ It’s all about the children and their dreams and wishes. It’s about the orphaned children in Tohoku as the result of the tsunami and the ongoing separation of families due to the radiation and relocation. As the result, indirect pressure is placed on these children. We must not forget them. The festival provides an opportunity to bring together diverse segments of Southern California’s Japanese American community in a fun and festive event with colorful kazari up to 7 feet tall on display. Local organizations, families, and individuals are encouraged to join in the celebration by creating their own decorations for the Tanabata Festival. In Japan, communities celebrate the story of Tanabata by writing wishes on pieces of paper and attaching them to bamboo branches. The city of Sendai in Miyagi Prefecture holds the biggest celebration each year with neighborhoods and businesses creating colorful decorations made from paper flowers and washi (Japanese paper) streamers. In Brazil and other countries around the world, Nikkei communities also participate with festivals. Now in its fifth year, L.A.’s Tanabata Festival is growing in popularity. The public is invited to participate in free workshops are offered at the Little Tokyo Public Safety Assocation’s Koban and Visitors Center, 307 E. First St. (near San Pedro Street), on Saturdays from 1 to 6 p.m. The making of the kazari is a fun and easy project. Kits, tissue paper, and washi paper are available for sale at the Koban. Generally, it takes about 30 minutes to an hour to learn how to assemble the kazari and select materials. Tanabata Planning Committee members will be on hand for the workshops. Deadline to register for the kazari design contest is Thursday, Aug. 1. Registration is $10 per kazari. Registration forms can be picked up at the Koban or downloaded from www.jhills.com. Past participants are encouraged to enter kazari from past years for this year’s Tanabata Festival. The kazari will be judged in multiple categories, including groups and, new this year, theme. Groups include businesses; families/individuals; government; schools, churches, temples and nonprofit organizations; kenjinkai; and manga/anime. The latter category is open to all participants. Last year, more than 200 colorful kazari were proudly displayed in front of the Geffen Contemporary at MOCA. The decorations were made by members of various organizations, including churches, kenjinkai, community centers, businesses, and youth groups. Senior residents at Keiro and Little Tokyo Towers made multiple kazari. Many multigenerational groups and families participated, forging stronger community and familial ties. As people worked together to fold flowers and assemble their kazari, conversations flowed. As a cultural tradition was shared, friendships were renewed and strengthened. Yoshihito Yonezawa, former president of the Miyagi Kenjinkai, fulfilled his dream to bring the Tanabata Festival to Los Angeles. Working together with the Nisei Week Foundation, Nanka Kenjinkai Kyogikai, and the Little Tokyo Public Safety Association, his wish became a reality in 2009. The Tanabata Festival was inspired by a popular folk tale, “The Princess and the Cowherd.” The weaver maiden Orihime, who wove clothes for the heavenly beings, fell in love with an ox herder named Hikoboshi. When both of them — too consumed by their mutual love — began to neglect their duties, the gods punished them by turning them into two stars and put them on opposite sides of the Milky Way. Noting their sadness at being apart, the gods agreed to one conditional respite — once a year on the seventh day of the seventh month (“Tanabata” in Japanese), magpies would fly up into the sky and form a bridge across the galaxy, allowing the lovers to reunite for just one day each year.